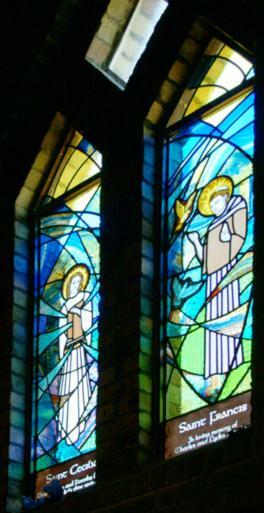 Saint Francis of Assisi stained glass window cartoon. The term cartoon originated in the Middle Ages and first described a preparatory drawing for a piece of art, such as a painting, fresco, tapestry or stained glass window. In Medieval times the cartoon was drawn directly on the surface of a whitewashed table, which was then used as a pattern for cutting, painting and assembling the window. 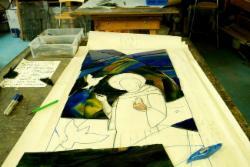 The cartoon is then divided into a patchwork, providing a template for each small glass piece. The exact position of the lead which holds the glass in place is also noted as it is part of the calculated visual effect. 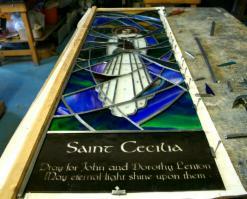 Saint Cecilia stained glass window leaded up and ready to be soldered. St Ninians Church, Scotland. Saint Francis of Assisi and Saint Cecilia installed. Stained glass dove. Church, Scotland. 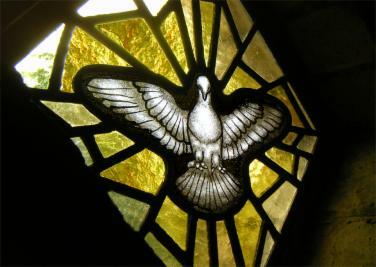 Based on the dove in Saint Peter's Basilica. Stained Glass Page 1, Page 2, Page 3, Page 4, Page 5, Page 6.